The legendary story of Cliff Young is already known to many runners. If you aren't familiar with it, you're in for a fascinating read. When the race started, the pros quickly left Cliff behind. The crowds and television audience were entertained because Cliff didn't even run properly; he appeared to shuffle. Many even feared for the old farmer's safety. When the morning of the second day came, everyone was in for another surprise. 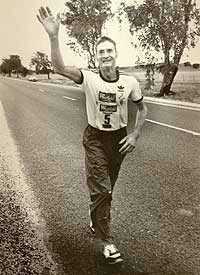 Not only was Cliff still in the race, he had continued jogging all night. Eventually Cliff was asked about his tactics for the rest of the race. To everyone's disbelief, he claimed he would run straight through to the finish without sleeping. Cliff kept running. Each night he came a little closer to the leading pack. By the final night, he had surpassed all of the young, world-class athletes. He was the first competitor to cross the finish line and he set a new course record. In the following year, Cliff entered the same race and took 7th place. Not even a displaced hip during the race stopped him. 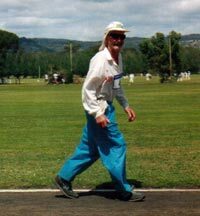 Cliff came to prominence again in 1997, aged 76, when he attempted to raise money for homeless children by running around Australia's border. He completed 6,520 kilometers of the 16,000-kilometer run before he had to pull out because his only crew member became ill. Cliff Young passed away in 2003 at age 81. Today, the "Young-shuffle" has been adopted by ultra-marathon runners because it is considered more energy-efficient. At least three champions of the Sydney to Melbourne race have used the shuffle to win the race. Furthermore, during the Sydney to Melbourne race, modern competitors do not sleep. Winning the race requires runners to go all night as well as all day, just like Cliff Young.